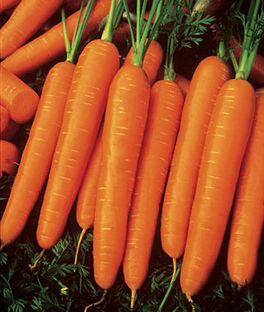 Like many other vegetables, carrot varieties can be divided into early, main-crop, and storage varieties. They also come in several Types that vary in size and shape, as well as a range of colors, from the classic deep orange to purple, white, yellow, and red. See Growing Carrots for information on how to grow carrots. 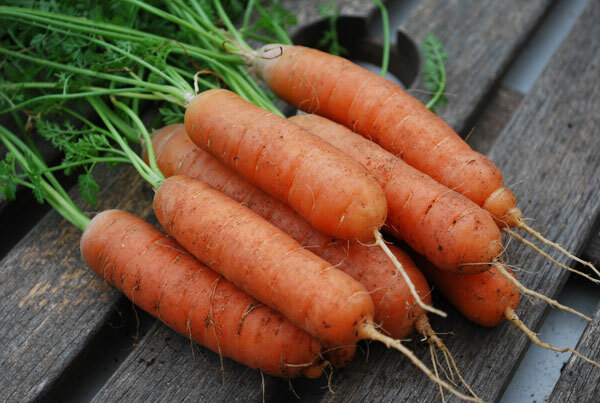 Nantes varieties are usually the easiest carrots for home gardeners to grow. They produce sweet, crisp, 6-7” (15-18cm) cylindrical carrots, with blunt tips. 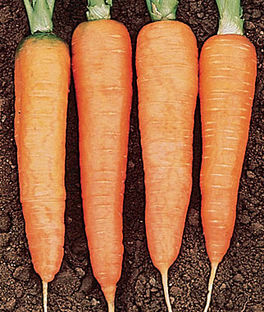 Nantes carrots perform better in heavier, rockier soils where other carrot types twist and fork. They’re less likely to form pithy cores when left in the field than Chantenay carrots. 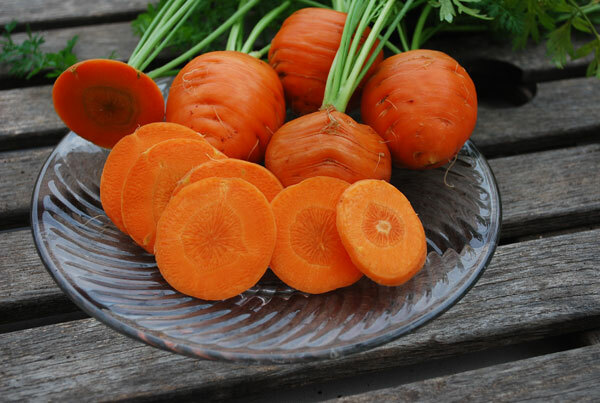 'Scarlet Nantes' (F1, 65-75 days) is a sweet, versatile Nantes-type carrot that forms uniform, 6-8" (15-20cm) carrots that are perfect for fresh eating or storage. 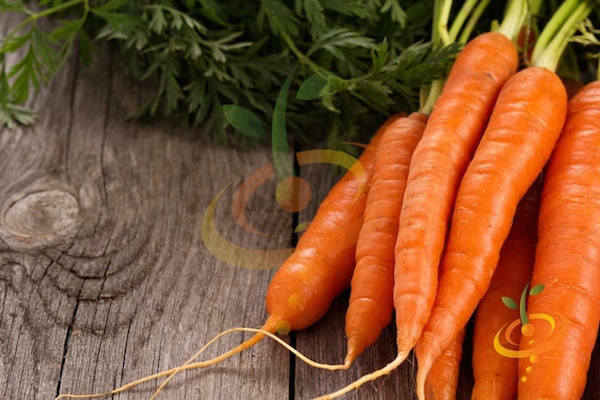 ‘Bolero’ (F1, 75 days, resistant to Alternaria Blight and Powdery Mildew) is a high-yielding Nantes-type carrot that stays sweet even in storage. 6-7” (15-18cm) long, with a 1 ½” (4cm) crown. Cylindrical shape. ‘Nelson’ (F1, 58 days) is another early Nantes that produces 6-7” (15-18cm) carrots with a 1” (2.5cm) shoulder. Sweet, uniform, deep orange color. Grows well in heavy soils. ‘Napa’ (F1, 63 days, resistant to Alternaria Blight and Powdery Mildew) produces 7-8” (17-20cm) carrots with a 1 ½” (4cm) shoulder, deep orange color, and sweet, crisp taste. Performs well even in heavy soils. ‘Touchon’ (Open Pollinated, French Heirloom, 70 days) is similar to ‘Bolero’, but grows a little larger (8”–20cm). Sweet and tasty even when small, it can be harvested at any size. 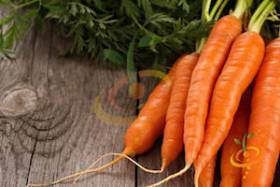 ‘Parano’ (F1, 65 days) is an early Nantes type that produces beautiful, 6-7” (15-18cm) carrots that are great fresh, cooked or juiced. 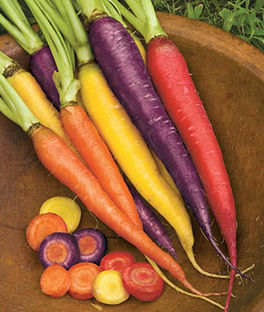 ‘Kaleidoscope Mix’ (60-70 days) is a multicolor mix of red, purple, yellow, and orange 7-8” (18-20cm) carrots. Contains equal parts of 'Atomic Red', 'Bambino', 'Cosmic Purple', 'Lunar White', and 'Solar Yellow' seeds. A Burpee Seeds customer favorite. 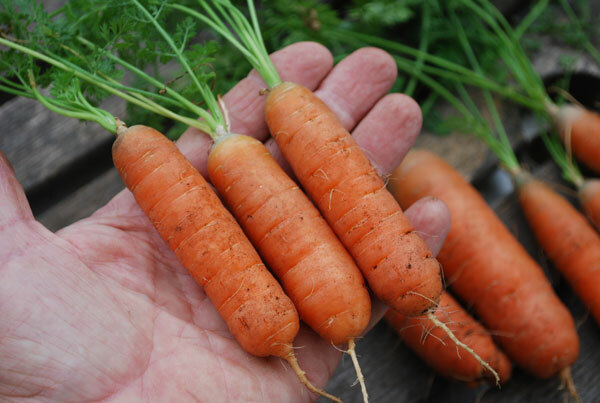 ‘White Satin’ (F1, 70 days) produces crisp, white, 8” (20cm) carrots. 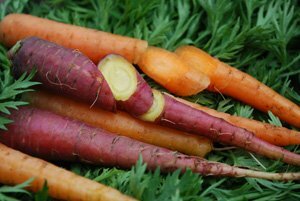 A Nantes variety that adds a different color to the carrot rainbow. ‘Merida’ (F1, 240 days) is a storage-type Nantes variety bred for overwintering in the ground. Plant in September or October. Can be grown with no cover in Zones 6 and up. Cover with 6-12” (15-30cm) of straw in colder zones. Sweet, 7-8” (17-20cm) carrots with 1 ½” (4cm) shoulders. ‘Purple Dragon’ (F1, 70 days) produces 8-10” (20-25cm), tapered carrots with purple skin and a bright orange core. A throwback to the original carrot. Color fades when cooked. A phytochemical gold mine for the body. Imperator carrots are the classic long, tapered roots you see in stores. Soil has to be prepared to fine tilth at least a foot deep to grow Imperator carrots. 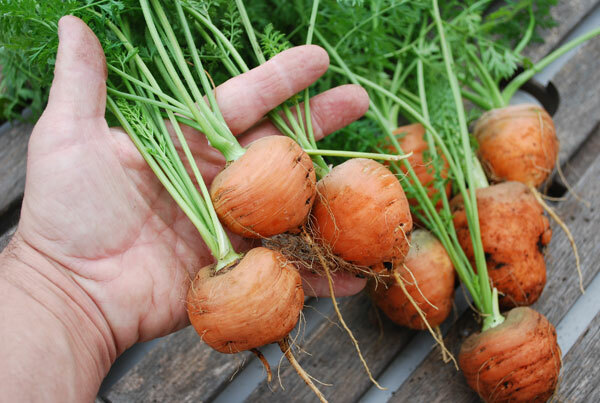 A light, sandy loam soil is ideal for growing Imperator carrots. Choose shorter varieties if your soil is heavy or rocky. ‘Atomic Red’ (65-75 days) has slim, tapered roots that reach 11” (30cm). Best when cooked. Retains its red color after cooking. 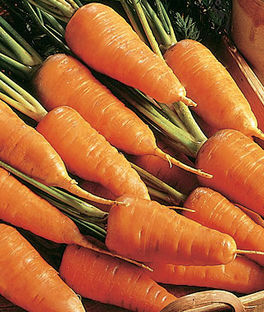 Chantenay carrots are short and stout, with broad 1 ½- 3” (4-8cm) crowns tapering quickly to a rounded point 6” (15cm) away. Before Nantes varieties were developed, these cone-shaped carrots were the only choice for gardeners growing carrots in heavy or rocky soils. They’re still a favorite among home gardeners, but older carrots develop a woody core, so harvest Chantenay carrots at 6-7” (15-18cm). 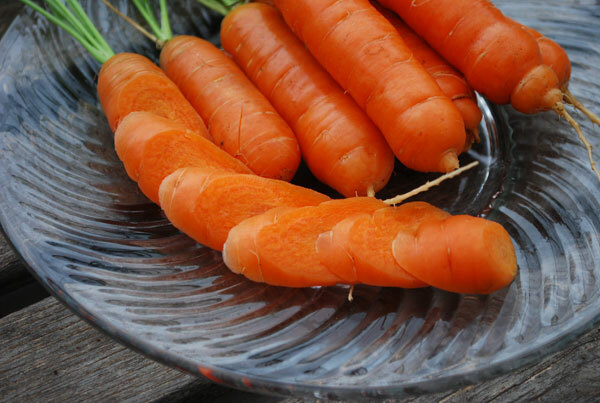 ‘Red-Cored Chantenay’ (F1, 60-70 days) produces 7” (18cm), deep-orange carrots with 2” (5cm) shoulders and the classic cone shape of Chantaney carrots. Grows well in heavy soils, stays sweet in storage. ‘Hercules’ (F1, 65 days) produces 6-7” (15-18cm) carrots with broad shoulders. Good for rocky of clay soils where other carrots perform poorly. “Mini” and Radish-style carrots are bred to be grown in shallow root zones and harvested small. These are the best varieties for growing carrots in containers. They also perform well in heavy or rocky soils. ‘Babette’ is a “baby” carrot variety that can be harvested at 3-4” (7-10cm), or allowed to grow larger. Often served whole, with the tops still attached at high-end restaurants. 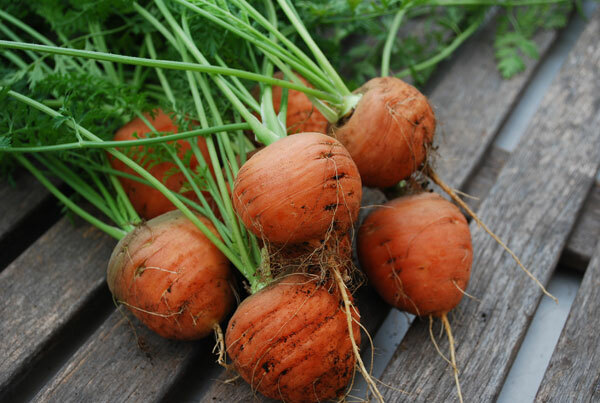 ‘Romeo’ is a radish-style carrot variety that produces 1-2” (2-5cm) spherical carrots the size of small beets. Beautiful in cross-section, with a delicious carroty richness.